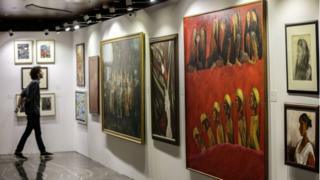 Fifty-five pieces of art were sold in Mumbai to raise money that Mr Modi, 48, allegedly owes Indian tax authorities. The diamond trader is wanted for his alleged role in India's largest bank fraud, totalling some $2bn (£1.5bn). Mr Modi, whose jewellery has been worn by celebrities such as of actress Priyanka Chopra-Jonas, was arrested in the UK last week. He is being detained in the UK and could face extradition. Indian authorities had hoped to recover $7.3m through the art sale but many of the pieces sold above their estimate. Auctioneers said the sale was the first of its kind, as Indian tax authorities usually auction property, gold and luxury items rather than art. An oil-canvas painting by Vasudeo S Gaitonde, one of India's most prominent abstract painters, sold for $3.7m. Punjab National Bank (PNB), India's second-largest state-run bank, says Mr Modi is one of the main suspects in a $2bn fraudulent scheme. Since Mr Modi fled India in early 2018, authorities have seized assets, including lavish properties and some 170 pieces of art. Mr Modi has denied wrongdoing. Police in London said he was arrested last Tuesday on the request of Indian authorities, who have asked for his extradition. He has been remanded in custody until 29 March. Mr Modi's case was thrust back into the limelight after The Telegraph newspaper found him living in a $10.5m London flat earlier this month.